I'd always wanted to take up surfing. Even as a kid I remember flipping through surf magazines, amazed by all the incredible photos - sheer poetry in motion. Years ago, after reading a travel article I added 'surf lessons in Costa Rica' to my Sweet List. Recently I got a chance to make that dream come true with my friends Jeana and Ianthe when we signed up for surf lessons at the Green Iguana Surf Camp in Dominical, one of Costa Rica's few classic surfing towns on the Central Pacific coast. Unlike most of the northern towns along the narrow coastal strip of the Central Pacific, Dominical is relatively undeveloped, and therefore a hidden gem. Until recently, roads south of Jaco were mainly interconnecting potholes of dirt and gravel making it an excruciating three and half hour drive from San Jose Airport. The bumpy ride was not for the feint-hearted, which made Dominical a destination mainly for surfers and backpackers. Surrounded by rain forests, the town sits on the Pacific ocean bordered to the north by the Río Barú, and to the east by the jungle-swathed mountains of the Cordillera de Tamalmanca that jut up from the coastline and frame long stretches of palm-fringed beach. Playa Dominical is known as the most consistent surf spot in Costa Rica, and is visited by surfers the world over. Its two-mile stretch of beach virtually disappears from view once you get offshore to catch a wave. It is also known as a powerful break; there may be bigger waves elsewhere, but Dominical's big, mid-tide waves hammer you hard. Rip tides can be ferocious, and swimming a risky activity. For this reason lifeguards are on duty all day. But whether you're out with your surfboard, or just lounging on the beach beneath lush green vegetation, there's something for everyone here. Half way to Dominical, our driver Johnee stopped to show us cocodrilos. With our limited Spanish we had no clue what he was referring to, but from his hand gestures we mistakenly guessed giant eels. Instead, he walked us over the busy bridge and pointed out dozens of crocodiles lazing under its concrete structure. Apparently the locals had started feeding them to attract tourists, and now these huge reptiles used the area as their regular feeding grounds. Even still they looked quietly ferocious. I'm not sure if I misunderstood Johnee but I could have sworn he said the crocs had snatched a couple of humans. By the time we pulled into Hotel Diuwak, it was dark and we were all grimy, hungry and exhausted. The air in Costa Rica is hot, thick and moist and it takes a few days to acclimate. Although our friend Jeana seems to thrive in this sort of weather, Ianthe and I are both more accustomed to the hot, dry climate of Los Angeles. We'd initially ordered a non-air conditioned room but within moments of unpacking we requested the remote for the air-conditioner. Afterwards, we blindly found our way in the dark, skipping over mud and puddles to Tortilla Flats where we had our first Costa Rican meal. It's the only beachfront bar and restaurant in Dominical making it a popular hangout for both locals and tourists. On the menu is a mix of American and local cuisine, or comida tipica. Black beans and rice (gallo pinto) is the backbone of Costa Rican cuisine and is served with the casado, or "marraige" of basics that also includes meat or fish, fried plantains, and a carrot, tomato, and cabbage salad. We tried many of the local dishes during our trip, but nothing quite hits the spot like Nachos and cold beers. The two most popular brands of cervezas are Imperial and Pilsen. After devouring our meal, we went back to the hotel. Our two friends Jimmy and Rene, who flew in an hour after us were M.I.A. and we had no way to contact them. They'd opted to rent a car and drive themselves to Dominical since they were only staying for the weekend. We feared they'd gotten lost as the roads don't seem clearly marked. They finally knocked on our door sometime after midnight with tales of a harrowing drive playing Frogger, near misses with cows, monsters, and other unidentifiable creatures. The next morning I was up early to explore the town, which took all of 15 minutes. My first agenda was coffee, and I settled in at Cáfe Delicias on the opposite side of town. I ordered a cup of latte soya, and sat down to redraft my book except the humidity caused the paper to become damp and curl around the edges so I finally gave up, and just allowed myself to enjoy the moment. When I got back to the hotel everyone was having breakfast at Tu-Lú, the hotel open air restaurant. The morning was already hot and humid, and we were all eager to hit the beach. We'd discovered earlier to our disappointment that like most of the property, the pool was also under renovation. So we packed up our belongings and headed to Playa Dominical, a 3 minute walk from our hotel, and found a shady spot under some mangrove trees. The water was warm but surprisingly refreshing. Rene thought ahead to bring beer, and we sipped from our warm cans of Pilsen while enjoying the sights and sounds of the ocean. It wasn't long before Jeana, Ianthe, and I had to rush back to the hotel for our first scheduled surf lesson. Earlier the skies had broken open, and we'd been caught in a downpour. We weren't sure if they'd go ahead with the lesson but in typical Tico fashion it was business as usual. After all, it rained every day in the rainy season, and we'd come at the cusp of it. Surfing in the rain turned out to be one of the most amazing experiences of our lives. And we were lucky to have Jimmy and Rene with their waterproof camera record the session for us. Our instructor was a local Tico named Ramon, and after helping us choose our long boards, he loaded us up in the van and drove us to Playa Dominical. He taught us the basics of surfing, which included 'what to do' scenarios in case we got tangled up in a rip tide. Before we hit the water, we practiced on the beach jumping up onto our boards until he felt we'd gotten the gist of it. Long boards are awkward to carry unless you have long ape arms to tuck them under your arm pits. And we each struggled to carry ours into the water. Once in, the waves pushed us back with the force of a two ton truck. That in itself exhausted us before we ever even caught a wave. It took us several tries but we all managed to get up at least once. And the feeling was nothing short of exhilarating. Each time Ramon shoved us off, I could hear him yell, "Get up! Get up! ", and you really had to put thinking aside, and rely on sheer instincts to get up and catch a wave. After nearly two hours, we were all exhausted. By the end of it, we'd been pounded by both waves and boards, and were feeling battered and bruised. Food and beers were the all-remedy, and we ended up back at Tortilla Flats. It was crowded, everyone having sought cover from the rain. We must have sat there for hours just enjoying the sight of the rain. All the bars and restaurants in Costa Rica seemed to be open air ones, with only a roof to keep you covered from the relentless rain. The good thing is that it keeps the air circulating so you can keep relatively cool. That night we had dinner at Coconut Spice Restaurant, which specialized in Thai dishes. It sat back from the main road with a view of the Río Barú. Like most of the eating establishments in town it too was an open air restaurant so we took turns repeatedly spraying ourselves down with mosquito repellent. The food was filling if not necessarily awe inspiring but it was a nice break from the typical food found in town. The next day we'd arranged to go zip lining, so we rescheduled our next surf lesson for another day. We drove to Hacienda Barú National Wildlife Refuge & Lodge. Its 815 acres boasts a variety of Habitats, from wetlands and secondary rainforest in the lowlands to primary rainforest on the highland coastal ridge. There are seven kilometers of walking trails and three kilometers of pristine beaches to be explored, as well as an orchid and butterfly garden. 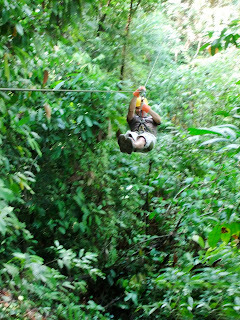 According to their website, the rainforest Zipline Tour imitates the flight of the chestnut-mandibled toucan as it leaps off a branch down through the forest and then up in to another tree. The tour included 8 separate cable rides that took you from one ridge top to another, across valleys and streams. There were 14 land based platforms and 1 tree platform with a view of the coast. Our two guides Carlos and Pedro were both entertaining and knowledgeable about the local fauna and flora. Right off the bat, we saw an anteater. After putting on our zip lining gear, we started off on the trail. Pedro went ahead to locate animals for us with his telescope, and along the way we stopped to view a sleeping sloth high in the trees. Our group also tasted termites, which everyone claimed tasted nutty like sesame seeds. I took their word for it. Carlos also demonstrated on Jimmy how indigenous tribes used the pincers of soldier leaf cutter ants as 'stitches' for wounds. The ant is positioned with its pincer on either side of a wound, then it bites. Once it does, it doesn't let go, so you simply twist the body off the pincers - instant sutures. Jeana even volunteered to have a gecko latch onto one of her ears, instant earring. At the first zip line platform, there was a storage shed. As soon as Carlos opened it, we saw giant cockroaches and small bats scrambling to get away from the light. As we prepared for our first cable ride, I heard Pedro cursing as a scorpion climbed out of his glove. To my guides' amusement, I immediately removed and shook my own gloves to empty them of any uninvited guests. Our first ride was both an adrenalin rush and scary as hell. But Pedro was always at the other end to catch us. Once you gain momentum, you fly through the air and sometimes I wasn't sure if he'd be able to stop me before I hit a tree head on. I'm convinced he waited till the last moment, just to watch me go into a tizzy. Our adventure lasted about 2 hours and afterwards we stopped for lunch at a soda to gear up for our next destination, Manuel Antonio National Park. The highways, streets and markets of Costa Rica are filled with sodas, or small restaurants that serve light meals and snacks. At Rest. Club Roncador they were grilling up pork on a giant barbeque. Most of us ordered a casado with that fresh grilled pork, and it was delicious. Ianthe ordered arroz de mariscos, or seafood rice that included everything from fish, clams, shrimp, octopus, to crab legs. After filling our bellies, and cooling off with beer we were all a bit comatose from not only the good food, but the heat. We all longingly eyed the shaded couches and hammock. Soon we were off again. One of the country's smallest national park, Manuel Antonio National Park is also one of the most stunning with a diversity of wildlife. It contains a combination of mangrove swamps, rain forest, beaches, and coral reefs. The beaches are lined with lush forest, which is home to sloths, iguanas, squirrel monkeys, and colorful crabs. There are several trails that meander through the park, including the main one that leads to Cathedral Point, which was once an island but is now connected to the coast by a thin strip of island. This land bridge forms a spine separating the parks two most popular beaches, Playa Espadilla Sur and Playa Manuel Antonio. We took a trail that led to a small but beautiful waterfall with a crystal clear pool. The trail was tricky at times as we had to cross over a couple of creeks to get there. Jimmy took the opportunity to cool off under the sprays, while the rest of us watched on safer ground. When we got back on the main trail, we saw a couple of deer eating. Other than giving us a cursory glance, they pretty much ignored us. We also sighted a few howler monkeys high above in the trees, but the real treat were the squirrel monkeys, known locally as mono titi, playing in the mangrove trees at Playa Manuel Antonio. We hung out for awhile to relax, swim, and take photographs. In the busy touristy town, we took a short stroll and stopped for ice cream. Jimmy and Rene left early the next morning to catch their flight back to New York and we were sad to see them go. After hitting the beach in the morning, the three of us geared up for our second surfing lesson. Our instructor was a character named Bob, who was originally from Southern California but had made Dominical his home for years. Bob was in his early 50's but an old surf pro, and what he didn't know about surfing wasn't much. After we met the rest of the folks in our group and picked out our long boards, he drove us 15 minutes south to Playa Hermosa. For the first 20 minutes or so he taught us how to "hop, pop, and lock". His surfing techniques were a little different from Ramon's and I kept getting stuck between their two different instructions. My motto has always been "less thinking, more doing" but I was having a tough time getting out of my own head. Ianthe told me she could see me out there thinking way too hard. Needless to say, I didn't get up that day or for the next three lessons. It was real frustrating, but what I lacked in skill I made up in determination. I don't give up easily, so I kept going out fighting the pounding breaks to try again. Bob kept repeating, "What's rule number one? Catch the wave. What's rule number two? Catch the wave." Another thing he taught us was about resistance. The trick to surfing is to spend the least amount of energy by finding the path of least resistance. This applies to everything from paddling out past the breaks, to popping up on your board, and catching the best waves. Easier said in theory, than in practice. But I have to say that both our instructors had an infinite amount of patience. You could tell they really wanted us to catch that wave, almost as much as we wanted to. But the great thing about surfing is that if you miss one wave, there's always another chance. Each wave is different from the last, which also means each ride is unique in itself. The thrill however remains constant. After cleaning up from our lesson we all met up for a late lunch. We found a cute little place named Crispus with a beautiful view of the river. Their specialty was crepes but we opted for salads. I had a delicious Greek salad, while the girls had Caesar. Later for dinner, we hit San Clemente Bar & Grill. Of course it'd started raining again, and by the time we arrived we were soaked through. After we'd eaten we took turns playing darts, and ping pong. Then it was early to bed for another day. One of the short jaunts the surf school arranged for us was to a reptile refuge. There we found all sorts of local snakes, turtles, and iguanas. Another was inter tubing down the Río Barú, which we skipped in lieu of spending time with Jimmy and Rene. Some of the others we spoke to said they enjoyed it, minus the sunburns and mosquito bites. After our fourth surfing lesson, Bob stopped at a roadside bar so we could cool off with a couple of beers. And later that night we went back for karaoke night. Jimi and Veronica from Canada had a rental car, so the six of us piled in for the short distance. Bob met us there where he entertained us with his karaoke skills. Even Ianthe serenaded us with a Bonnie Tyler classic, followed by Jeana and her rendition of YMCA. The next day after our surf lesson Ramon took us to a small waterfall. We weren't the only visitors, as there were three young local boys there swinging and doing flips off a tarzan rope into the water pool. They entertained us for quite awhile with their dare devil tricks. We were all too chicken-hearted to give it go but the dip in the pool was refreshing after the salty ocean. Definitely one of the highlights of the trip for me. For our last surf lesson, Bob piled us in the van for the 40 minute drive to a private beach called Playa Ventanas (windows beach). The beach gets its name from the sea caves that line the north and south ends of the beach. The two caves on the north end extend from the beach out to the ocean, and during certain tides creates a sort of "blowhole" effect. Pressure from each wave blows a large cloud of steam out onto the beach. This day was by far my best surf day, as I managed to catch and ride several waves. In fact, everyone did extremely well even though towards the end of the day it was near impossible to get past the breaks. That very night, the three of us drove out of Dominical in our rental car and headed north to La Fortuna to visit Volcano Arenal. Leaving was bittersweet, but we all vowed to return to our quaint little surfing town. On our way out, we stopped at Rest. Club Roncador again for dinner. We all agreed that it was by far our best meal in Costa Rica. As well as arroz de mariscos, we ordered sopa de mariscos, a delicious seafood soup with pieces of filleted fish, clams, shrimp, squid, and crab claws, served with a side of rice. The drive to La Fortuna took about 5-6 hours, and we arrived sometime after midnight. Along the way we'd been barraged by rain, as we navigated somewhat treacherous, dark and windy roads. We crossed over dozens of single lane bridges, stuttered over unexpected speed bumps, and clumsily passed blind behind slow moving vehicles. Needless to say, we were exhausted by the time we checked in. Hotel Montaña de Fuego is located outside of town at the foothills of Volcano Arenal. Our room was a wooden cabin-like structure with a small porch that looked directly out towards the cone-shaped volcano. It was pretty amazing to wake up to that view, and see a cloud of smoke billowing from its peak. After breakfast we drove out to Parque Nacional Volcán Arenal for a hike. We opted to forgo a guide as the trails were clearly marked. The park is located on Arenal's west side, and its lava is now erupting towards the West and Southwest. The short trails pass through secondary forests and old lava fields from previous large eruptions. I was constantly amazed at the plant life we came across, some practically looked prehistoric. There were amazing colorful flowers, butterflies, dragonflies, as well as strange creepy crawly insects. We even came across an all-white albino cockroach. But the most amazing find was the Horned Viper snake another trail goer pointed out to us. We'd seen this very same poisonous snake at the reptile farm in Dominical, only this was living uncaged in its natural habitat. At the old lava fields, I saw a bright yellow beaked toucan flying above - the first we'd seen since arriving in Costa Rica. Another highlight was a gargantuan tree in the middle of the forest. All the while we were hiking we kept hearing strange rumblings but it wasn't until the trail opened up to a clearing that we realized it was the volcano erupting. We even managed to see lava rocks tumbling down the sides of the volcano. No fire red lava though. Afterwards we went to Arenal Observatory Lodge which is perched high on a ridge 1.7 miles from the active crater of Volcán Arenal. The original buildings were erected in the 1970's to house scientists and researchers who came to study the active volcano. Now the lodge offers over 40 rooms to tourists. We stopped for a snack at the lodge restaurant only to be disappointed by its mediocre 'continental' cuisine and fat prices. We ended up munching on fries, and sipping on cool drinks. The property had an interesting 'hanging bridge' held up by cables that led to another section of the lodge that also housed its tiny museum and observatory. It was definitely worth a look for the different perspective of the volcano. That night we relaxed at the hotel's hot tub and pool. A great way to wind down after a great trip. The next morning we checked out at 4:30 am for the three and half hour drive to San Jose Airport - back where we started from 10 days before. We got a chance to see most of the scenery we'd missed during our night drive, and the countryside was nothing short of amazing. I definitely look forward to returning, and can highly recommend Costa Rica as a vacation destination whether you're surfing, hiking the national parks, or just relaxing at the beach. Thanks girls for a lovely adventure.